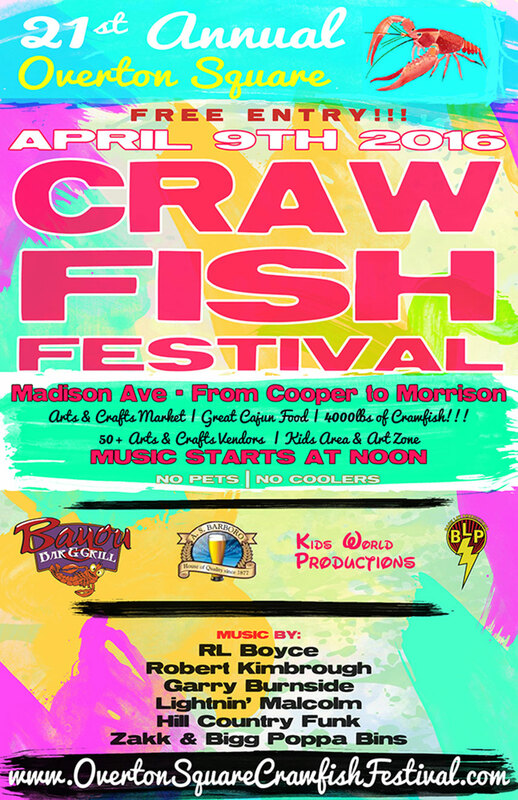 The 21st Annual Overton Square Crawfish Festival features 50+ Arts & Crafts Market Vendors, a Kid Zone with Arts & Crafts, Great Cajun Food and 4000 pounds of Mudbugs! Enjoy music from RL Boyce, Robert Kimbrough, Gary Burnside, Lightnin’ Malcom, Hill Country Funk and Zakk & Bigg Poppa Binns. Unique and tasty crawfish cuisine takes the spotlight at Overton Square Crawfish Festival, a celebration of local culture and Southern cooking. The outdoor festival features a variety of crawfish and Cajun dishes with delicious sides and beverages. In addition to thousands of pounds of crawfish to enjoy, the festival features live music and arts and crafts vendors.